Avengers: Infinity War spoiler-free review: "Bold, ballsy, satisfying, and dramatic"
The Avengers latest stand is well worth the wait. It’s not perfect, but it goes to place most tentpole movies wouldn’t dream of, while retaining the scale, excitement, and humour you’ve come to demand from an MCU movie. “So, this is it?” says Tony Stark (Robert Downey Jr.) in the trailer for Avengers: Infinity War. “It’s all been building to this.” He’s talking about the approaching menace of Titan warlord Thanos, a threat so great it’ll take the might of all the assembled Avengers (and then some) to even have a chance of stopping him. But he could equally be making a meta commentary on the Marvel Cinematic Universe itself: it has all been building to this. Ever since Thanos was teased in the mid-credits scene of 2012’s The Avengers, that film felt more like the start of something bigger than the conclusion to the epic MCU’s Phase One. Since then, the world has grown exponentially, exploring realms cosmic (Guardians of the Galaxy), quantum (Ant-Man), and multiple (Doctor Strange), and introducing conflict (Captain America: Civil War), out-and-out comedy (Thor: Ragnarok), and familiar faces (Spider-Man: Homecoming) into the fold. It has all been building to this. So the big question is: Is it worth the wait? Does it warrant the 10 years and 18 movies of investment? If you’ve given a damn about any character over the course of the series, do you need to see it? The answer is, broadly speaking, yes. In terms of blockbuster event cinema, they don’t come much bigger – or more eventful – than this one. Packed with incident from the off, its an onslaught of action, thrills, gags, and gasps, played out with an ensemble so gigantic it leaves all other extended universe crossovers in the dust. As you’ll probably have guessed, this probably isn’t the best place for an uninitiated newbie to start. If you haven’t already done so, you should probably go back and watch (most of) the previous 18 movies for context before you dive in with Infinity War. But for anyone who has pored over these movies in granular detail, been awed by the crossover combinations and wondered what the hell Thanos’ grand plan is, this film delivers in spades. The plot is very much in foot-on-the-pedal motion all the way through, without so much as a stop for breath. There are so many major, future-of-the-MCU-altering moments throughout that you might event forget some of the early big moments by the time you’re halfway through. All you really need to know before going in is that Thanos is on the way, and as he has crossed paths in some tangential ways with many of our MCU heroes prior to this, they’re all going to be drawn into his orbit. As his masterplan involves grand-scale annihilation, it’s going to take the biggest team-up yet to stop him. So as well as core Avengers like Stark, Thor (Chris Hemsworth), Captain America (Chris Evans), Black Widow (Scarlett Johansson), and Bruce Banner (Mark Ruffalo), more recent players such as Black Panther (Chadwick Boseman), Doctor Strange (Benedict Cumberbatch), Spidey (Tom Holland), and the Guardians are also thrown into the mix. 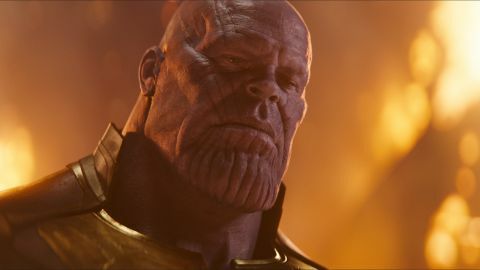 But, this time, far from being a mere cameo-er, Thanos’ is the throughline of the movie, the protagonist, if Infinity War can be considered to have one. CGI baddies with evil schemes have been the downfall of many superhero movies, but thankfully Josh Brolin’s hulking purple bruiser is no let down. As a piece of visual wizardry, he’s impressively textured and hefty, but more impressive is still is that there’s Brolin nuance underneath the pixels (that grin), and that while he might not reach Killmonger levels of sympathy, his plan does have shades of plausibility that prevent him from slipping into OTT maniacal-laugh territory. His scenes involving Gamora (Zoe Saldana) are his strongest, and they also provide a showcase for the Guardians’ green warrior to do some of her best emoting of the series. By necessity, no good guy gets a particularly huge amount of screentime here. As is inevitable with a movie like this, individual characters (besides Thanos) get cool moments rather than any real depth, but that’s part and parcel with this extended universe: your engagement will be highly dependent on how invested you’ve been thus far. Some heroes get more to do than others (if Thor gets a decent amount of screentime, Black Widow feels particularly short-changed), but ultimately, it’s a team effort in every sense. The heroes are mostly defined instead by their interactions with each other. Sparks fly between Stark and Strange, and Thor and the Guardians, to pleasing effect: the two goateed geniuses are frequently at loggerheads, and Star-Lord (Chris Pratt) is somewhat put out by Thor’s arrival on board the Milano, and the Asgardian has a winning repartee with Rocket Raccoon. Given minimal screentime, Elizabeth Olsen and Paul Bettany make the Scarlet Witch/Vision relationship convince. Oh, and Tom Holland continues to prove he’s the best screen Spidey yet, furthering his relationship with reluctant mentor Stark in the process. And – as the trailers have revealed – a key part of the climax takes place in Wakanda, and it’s a thrill to be back here so soon after Black Panther. Again, these characters and their relationships will mean less for newcomers, but for the committed fan there’s barely a beat that goes by without inducing giggles and/or dropping jaws. Despite the heavy, genocidal subject matter, there’s plenty of the MCU’s trademark humour, most of it delivered by the on-form Guardians, stealing pretty much every scene they’re in, and somehow managing to retain their unique tone even within this Avengers mix. And as well as the humour, there are moments of genuine emotion that you rarely get in this kind of tentpole movie (once again, that’s down to that accumulated investment). It reaches its highest moments when throwing together unusual combos of characters: in action sequences, odd-couple banter, and high-stakes emotional interactions. And its all set against a background of legitimate peril, as Thanos sets about retrieving the Infinity Stones he needs to enact his plan. Credit is of course due to directors the Russo brothers for pulling together something of this scale and ambition with such clarity and confidence. Having Thanos driving the narrative helps. The Infinity Stones have always felt like McGuffins, and even if their use and provenance isn’t always all that obvious, they’re a simple ploy for ratcheting tension: the more of the coloured gems that Thanos shoves into his golden gauntlet, the worse things get for future of life on Earth (and other planets). Even if you haven’t entirely kept up with the whereabout of the stones to this point, you’ll fare just fine. The action scenes are also delivered with flair and crunch: and as ever, the best involve characters working in unison and combining their powers in special moves. Crucially, you can always tell what’s going on in big fight scenes, and you never lose sight of the characters. There are quibbles. Thanos’ ‘children’ don’t make as much impact as you’d hope, and can feel indistinct at times. Ebony Maw is probably the only one of the Black Order you’ll remember when you leave the cinema, and even then, you probably won’t have picked up his name during the film. It’s easy to lose track of the whereabouts of the remaining members, or forget about them altogether. The stone-collecting can feel a tad repetitive, and certain plot threads are set in motion that won’t be resolved until the untitled Avengers 4 in 2019 (or maybe in the inbetween films, Ant-Man and the Wasp and Captain Marvel). But any complaints are small fry in a film this bold, ballsy, satisfying, and dramatic. For delivering on fan expectations that have snowballed during 10 years of the MCU – and doing so with wit, pace, and surprises aplenty – Infinity War deserves a huge, bejeweled high-five.